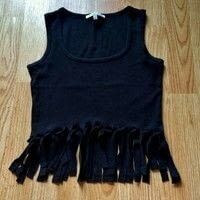 A really simple way to make a fringed tank top. 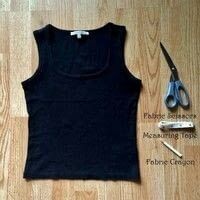 This DIY can also be used on other shirt styles and garments. Try your top of choice on first to determine the highest point you want your fringe to start at. I chose 6", but feel free to customize per your liking. 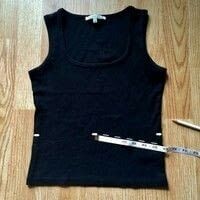 Lay your top on a flat surface, flatten out any creases/bumps, especially along the bottom where you will be cutting. Repeat same steps on the back side. Tip: Don't press down too hard on your fabric crayon, instead use short and light strokes; just enough to leave a guideline for yourself (mine is so faint you can barely see it in the photo). Now that you've marked all cutting lines, flip your top back over and place your tape measure directly overtop the centered/highest marking. I like to cut my fringes a little thicker, that way they don't get too skinny once the fabric starts coiling around itself. I use the tape measure as my cutting gauge (freestyle cutting), but feel free to draw these lines out at any thickness you wish, if this makes it easier for you. 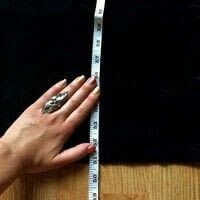 Holding the measuring tape firmly down with one hand, snip up to your marked line along both sides of the measuring tape. 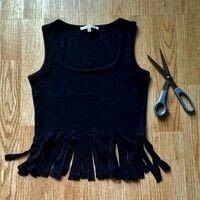 Be careful to slip your scissors in between the top layer of fabric only, or you may accidentally cut through the back of your top. 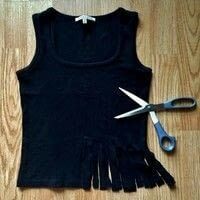 Continue cutting fringe pieces in long strokes along the bottom, until you have created a fringe around the whole top. 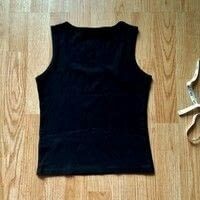 Your top should now look like this. 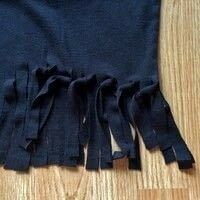 Take the two most centre fringe pieces and tie them together tightly. Continue working your way around until you complete the rest of the top. And that's it - you're done! Style as you wish.